Like an abstract painting that tells a story or invokes a feeling, slabs of natural stone emerge from quarries around the world with unpredictable patterns, hues, and tones, telling stories and creating moods without intrusion from a painter’s brush or a critic’s opinion. Since 2006, Adriene Araujo and her husband Fabio Venturini have been bringing these organic works of art to their customers at Vitoria International, LLC in their Charleston showroom, and are pleased to bring their passion, expertise, and resources to clients in their newest location, opened in Savannah in May of this year. Precisely finishing the 30 or more slabs sliced from each 20-ton-plus stone block they import, Vitoria’s extensive selection gives homeowners and designers the ability to choose individual slabs to execute their vision for a room or space with pieces that are cohesive, while accentuating the natural differences within each block. “We’re very proud of our customer service,” Araujo said. 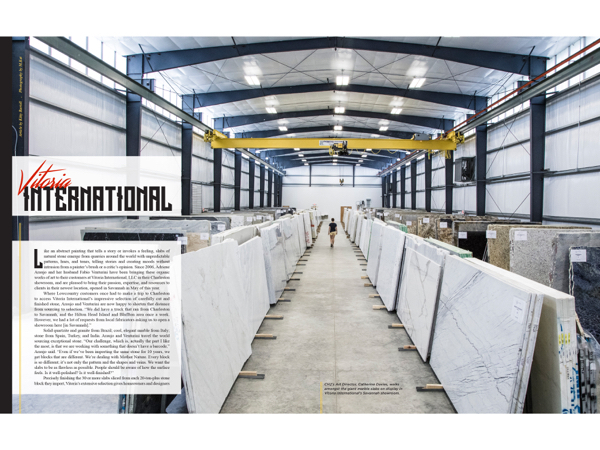 At Vitoria International, customers are encouraged to spend as much time as they would like to peruse the stone slabs lining the aisles of their showrooms. Because they purchase whole blocks of stone, and cut them into 3-cm slabs, customers and designers are thrilled to find several slabs that go together in tone and style, without literally “matching” each other. “Our main goal is to make sure that we have the right inventory,” Araujo said. “We are very particular about our suppliers and the stone that we bring in. We decided that we don’t want to do mass production. We are very selective with our product and spend the time with our customers. Fabio and I are at work every day. We have the direct feedback from our customers, and that matters a lot. We like that part of the business, because then we make sure we’re bringing in the right stone—that when somebody walks in here, they will find what they are looking for because we listened to them.” Their broad knowledge of the stone import business, and inspiration for their company name, came from their hometown of Vitoria, Brazil, where Araujo and Venturini met and cut their teeth on their business, literally, in the quarries found around Vitoria, often described as a beautiful, mini Rio. The new Savannah showroom was designed by, and built specifically for Vitoria International. Araujo and Venturini included every detail necessary to make their customers’ selection and buying experience pleasant and productive, and the care and keeping of their stunning inventory a priority. Once a customer’s selections have been made, the slabs are individually labeled and reserved for their project. All the inventory is grouped together by the blocks of stone from which the slabs were originally cut, are clearly labeled, and well-lit by the natural light coming into the meticulously designed showroom from the windows circling the entire building. Taking great care with their materials, Araujo said, “We don’t use fork lifts here.” A custom, overhead system of tracks and supports is utilized to gently lift and transport the stone from its home on the showroom floor to their delivery vehicles. The Vitoria International family is also involved with the non-profit watermission.org. Founded in Charleston, the organization works to develop sanitation and hygiene solutions related to the global water crisis. “Once we get settled [in Savannah], we want to find a location organization to work with, because we would like to be part of making a difference in the local community here, as well,” Araujo said. 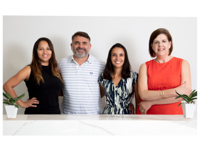 Growing their business and their family, Adriene Araujo and Fabio Venturini are enjoying welcoming customers to their new showroom in Savannah, where they are continuing the tradition of providing the finest stone materials imported from around the world and building their family of clients, telling great stories, invoking just-the-right feelings in homes across the Lowcountry. For more information, please visit vitoriainternational.com. 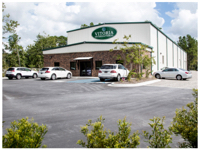 Locations include the Savannah Showroom, 149 Southern Boulevard, (912) 238-0014 and the Charleston Showroom, 3220 Goodiron Way, North Charleston, (843)760-2470.